Managing your finances after marriage is a challenge, but by working together, you will appreciate the financial benefits of being married. Well, hello there, married couple. Congrats again on getting hitched, even if it seems like ages ago. Chances are, as your relationship has matured, financial management post-marriage has gotten more complex. Like a lot of husbands and wives, I can attest to this personally. Let me guess: You probably have a bigger family to care for, a more expensive household to run, and more bills than ever before. Right? I look back fondly on when our biggest arguments were about where to eat for dinner. Now, things like what's the best elementary school for our daughter and what are we going to cut from our budget so we can save up for a trip to Disney World can set us up for a fight, if we're not careful. Thankfully, one of the most important areas where my wife and I have found success as a couple (and where we're most grateful) is in how we manage our money. From day one, we decided to be radically transparent about our earnings and expenses, to the point that we sit down every other week to go over bills, and talk out any financial anxieties we might be sitting on. With a glass of wine in hand, "Money Monday" as we call it, has (after some fitful starts) turned into one of the best nights in on the calendar. Thank god we confronted this hard topic early on in our marriage because it is a tough one to get right. Failing to have a plan to manage money and household finances is one of the root causes behind the breakups of otherwise happy couples — just ask any marriage counselor or divorce lawyer. Talk to divorced people and you'll hear endless anecdotes of how money was truly the root of many marriage evils, and how they wish they could have handled it better. 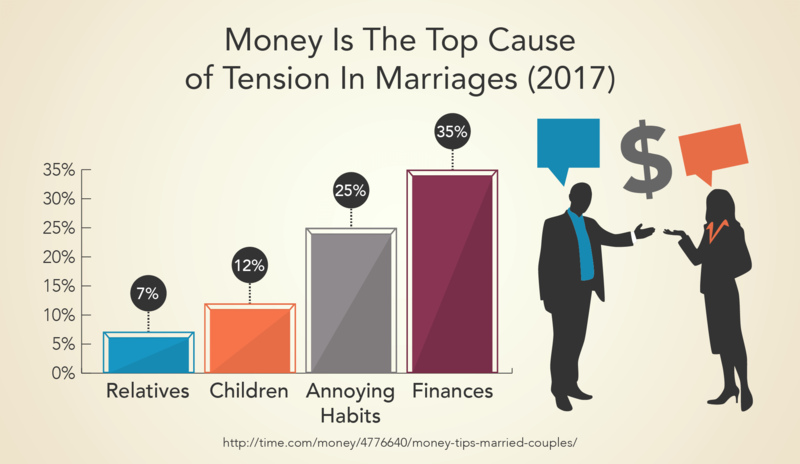 A SunTrust Banks survey exploring the role of money in relationships indicates that among those who report they have, ahem, "relationship stress," financial management was at the top of the list of stressors. Money was the number one cause of their relationship wear and tear. The survey found that stress over money comes down to our individual habits, values, and views on how to spend and save money. For instance, one spouse might be frugal, organized, and committed to long-term savings goals, while the other might have more of a "seize the day" mindset. Differences like this lead to bickering and resentment, or worse — hidden credit card receipts and secret bank accounts. The key to living happily (and financially secure) ever after is to establish good money habits early on in the marriage. That way, when an inevitable money emergency or financial challenge does emerge down the line, you'll be able to handle it as a cohesive unit, instead of pointing fingers at one another. My wife and I didn't get everything about money management right in the beginning. Believe me, we made our mistakes too. But we had one thing going for us: we felt we could talk openly with each other. The details about how to open joint accounts and save (and spend) together came later. 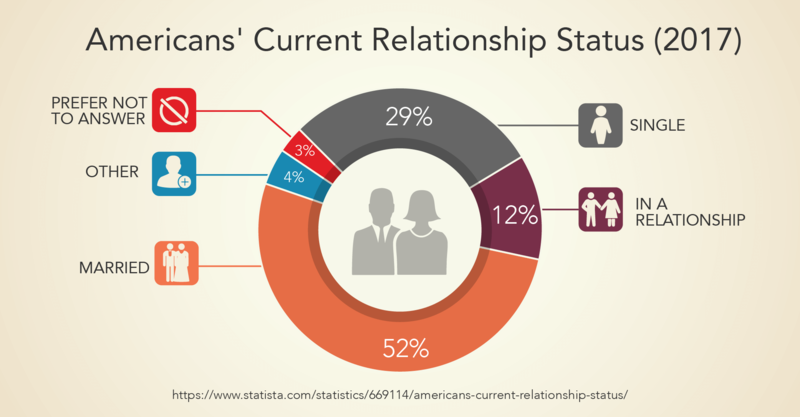 In fact, in a survey by financial services company Ameriprise, 66 percent of couples living in financial harmony say their unified front toward financial decisions didn't come naturally – it was something that evolved over time. Any couple can learn how to manage money. It's not impossible. Whether you're just starting out as a married couple, or it's already been years, we have organized all the information and expert advice you'll need. If you're going to be successful, married money managers, than you should know what pains and perks you'll face. In fact, once you examine the financial benefits of being married, you'll realize that the headaches of managing your money together pale in comparison to the financial benefits you two can reap if you don't stick your head in the sand. Simply put, when it comes to financial power, being married definitely beats staying single. Well, when you combine your income power and share expenses with another person you trust and respect, you can save and make more money than if you were alone. "I also think that the psychological process of settling down (which starts us thinking of buying houses, having kids, retirement, etc.) leads one to focus more energy on making and saving money," says Hannah. Of course, it doesn't end there. Some couples tend to live together forever without ever going through the motions of tying the proverbial knot. While this might be for good reason, it can certainly cause the couple to leave some important financial benefits on the table. Just being married isn't enough — you could be missing out on major marital money perks if you don't educate yourself about the advantages available. Yes, indeed — Uncle Sam rewards you for being married, as do insurance companies, credit card lenders, and more. Getting hitched has its perks, for sure. The best gift — avoiding taxes! Lucky you, the IRS offers an unlimited-every-which-way-you-slice-it deal that allows married couples to give their spouse any sum of money — or other valuable items, such as property or jewelry — without paying tax on it. The deduction applies to both estate taxes and gift taxes. Consider this: Your daughter is getting married and you want to bestow an awesome gift to her and her new husband to help them buy a home. Once you give $14K to your daughter (the maximum amount for a cash gift allowed by the IRS), you would normally be subject to a gift tax on anything amount above that. But with the combined giving power of you and your spouse, you can give $28K. Then, if you really want to win the "Best Parents of the Year" award, you can give another $28K to your new son-in-law, too. Double your tax-free home sale profit potential. If you're single and sell your home, you don't have to pay capital gains tax on the first $250,000 of profit. But if you're married, as financial writer Amy Livingston points out, and you and your spouse have both lived in the house for at least two of the last five years, this exemption doubles, allowing you to make $500,000 on the sale of your home and pay no tax at all. That's what we call a home, sweet, home deal! Share Social Security and other benefits. If either you or your spouse qualifies for Social Security benefits, you may receive the other spouse's benefits, explains writer Ivy Jacobson for TheKnot. Plus, once you hit 62 years old, or if you're caring for a child who can receive benefits and is younger than 16 years old or disabled, you can also potentially receive Medicare, disability, veterans, military, and pension plan benefits through your spouse. You have double (and bigger) everything! A cushier retirement. Couples have more flexibility with their retirement savings plans. A spouse may contribute to an individual retirement account (IRA) even if he or she doesn't work. What's great about being married is that couples enjoy more IRA benefits than single people for a longer period of time." Double the reward and bonus points. "Couples should look at their combined spending habits and seek credit cards with rewards that align with their spending," says Julie Pukas, head of US Cards and Merchant Solutions at TD Bank. Learning how to maximize credit rewards programs — especially when two people are earning points — can result in free flights, hotel discounts, cash back, and more. Powered-up earning power. Married couples can combine incomes when applying for a home mortgage and other financial products, and they can usually qualify for a larger loan with better terms. Insurance discounts increase. Married couples can qualify for multi-policy and bundled discounts on home and auto insurance. If you're not already taking advantage of this, give your insurance agent a call to see if combining your coverage can offer savings. Stress less over health insurance. If you do not have your own health insurance and your spouse is employed, you can usually get coverage through your partner at a discounted rate. In addition to the tax benefits and financial perks above, there is something comforting about knowing you have a partner with whom you can share your desires, hopes, and dreams with. Perhaps even more important is learning to share the burdens, worries, and stress that often result from financial setbacks. From an emotional and relationship standpoint, being married can help you achieve your money goals, knowing that you have another person (or a whole family) counting on you to do your part. But most importantly, you can always rely on the fact that you're not going through things alone. You have financial — and emotional — support. If a single person goes through a bad patch professionally (such as a layoff) or personally (such as a missing pet), they may not have another person to rely on to offset their loss of income. However, when you're married, your spouse is there to pick up the financial slack, and your family can work together to cut expenses and live leaner. You might even be able to go back to school or change careers knowing that there is someone there to help you finance your aspirations. Two is more powerful than one. "When couples can pool their resources together to save towards retirement and pay down debt, there is great power in that," says Bolanos. We find that couples who treat both savings and debts as ‘ours' tend to be more successful over time in a financial sense. In other words, even if you agree that certain aspects of your finances should be kept separate, tackling a shared goal can help you accomplish it more quickly and bring you closer as a couple in your shared achievement. You can boost your investment strategy. If you and your spouse each have a workplace retirement savings plan, sit down together and decide on a portfolio mix that uses both plans' investment options. As noted by the folks at Quicken, "Once you've agreed on an overall allocation — say, 50% U.S. stocks, 15% international stocks and 35% bonds — implement your strategy by picking the best-performing funds from each plan." You'll have more options in your retirement years. Because there are two of you, you may be able to take advantage of staggering your retirement years. When one spouse works longer, the amount of Social Security benefits the couple is entitled to will increase. The continued income from the working spouse gives the couple a few more years to save for retirement. A spouse who works an extra three to five years will likely have a shorter period over which to draw on his or her retirement assets, allowing for larger withdrawal amounts each year. By taking a step back and realizing the ways in which your marriage makes you stronger, you'll come to appreciate the mutually beneficial aspects of your financial partnership. As you can see, the very act of exchanging vows can bring plenty of financial rewards with it. Consider this for proof: Researchers at Ohio State University found that married couples experience individual net worth increases of 77% over singletons in their 20s, 30s, and early 40s. Married couples also see their wealth jump 16% for each year of marriage. By realizing that you're invested in each other's lives — both literally and figuratively — it will help you see past your minor money differences. The money squabbles of your newlywed days probably pale in comparison to those that have come up since adding kids to the mix. That's because having children is stressful. According to Money Magazine's Survey of Couples and Money, 80% of couples with children younger than 18 said they argue about money. And this is probably why: A middle-income, married couple with two children is estimated to spend $233,610 to raise a child born in 2015, according to the annual report released by the Department of Agriculture in early 2017. And that doesn't even include college expenses! The first potential challenge: Who is going to care for the children if you and your spouse both work? Can you afford to live on one income? And if having a stay-at-home parent is not an option, will daycare cause an added strain on your cash flow? A 2015 survey found that for most families, childcare is the single biggest expense in the budget. Keeping just one child in daycare costs an average of $181 a week, more than $9,400 a year. With two children in daycare, that cost jumps to $341 per week, or more than $17,700 per year. Ideally, there's a grandparent or relative who can kick in some childcare hours and save you some of that expense. But if not, there may be other solutions like asking for a flextime work schedule that allows a day or two at home to help offset some of the expense. 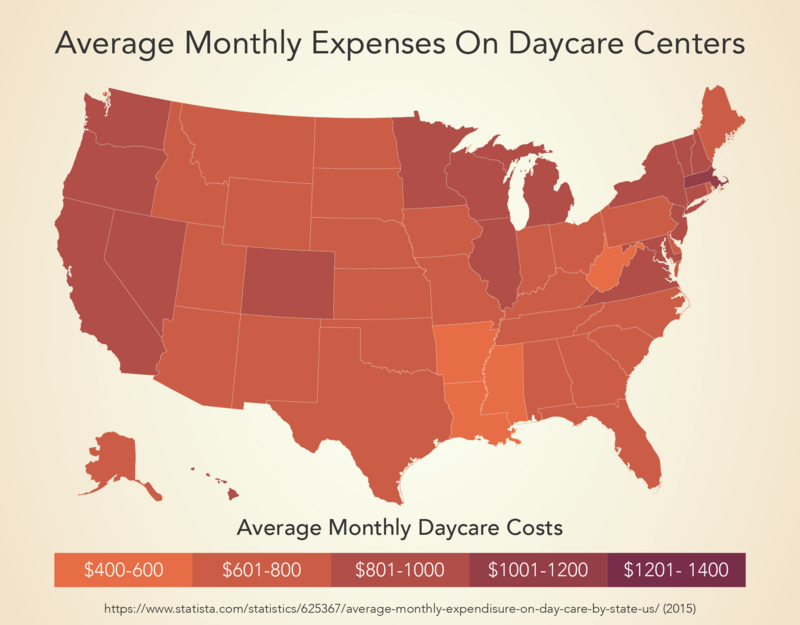 If full-time daycare is a must, making sure to budget for it (just like you do with your other bills) is the key to making it work. The good news is that this is all temporary — once kids start full-day school, many schools have after-care that's free, or at least relatively inexpensive compared to early childhood programs. You might have been perfectly content in a one-bedroom apartment in the early days of your marriage, but once your family begins to grow, your needs change. Space becomes a hot commodity, and the school district and neighborhood you live in becomes a major concern. Relocating or upgrading to home ownership costs money, and it almost always adds to the monthly bills. Can your relationship handle that? Like any other major decisions, don't buy into home ownership or commission renovations on your current abode without thinking through the financial angle. Are there expenses you can cut, or ways to earn more income? Discuss the sacrifices you're willing to make together in order to afford a bigger, better home. It might mean giving up vacations, or living without cable TV or gym memberships for a year or two, but doing it as a team will make the process easier. Here's another area where having opposite financial philosophies can cause a rift: educating your children about money. Getting on the same page about the money lessons you want to impart can be tough, but those are necessary compromises you'll need to make if you want to have a healthy marriage — as well as raise children who don't associate money with fear and fighting. Does one of you want to have a lavish birthday party, while the other thinks funding a savings account is more prudent? Getting on the same page about the money lessons you want to impart can be tough, but these are the necessary compromises you'll need to make if you want to have a healthy marriage (and raise children who don't associate money with fear and fighting). Agreeing ahead of time about issues, such as how much allowance to give, and finding a middle ground about how lavish a birthday party to throw, will be extremely helpful. Additionally, having age-appropriate conversations with your kids about wants vs. needs, what things costs, and saving money will also pay off in the long run. Aside from all of these cash complications, the idea that you're now financially responsible for these little people can be overwhelming. Plus, there's the cost of financing their health insurance, educating them, and keeping them entertained and enriched! More than ever, you'll have to communicate your feelings to your partner, make sacrifices together, and get serious about family money management if you want your ever-tightening budget to work. But if you do, trust me, you'll feel the impact almost instantly. Once my wife and I started functioning as a team, for instance, we realized our desires for our daughter were fundamentally the same, and that even though we partially disagreed on the specific path, we could both be confident we each had her best interest at heart. So far, our handy-dandy guide has touched upon some of the money-related stressors that married couples have to deal with. By exploring some of the most common money fights couples have, you can learn how to diffuse them before they get out of hand. Accepting that one spouse is the breadwinner can be difficult, especially if those roles shift during the course of the marriage. As Mike Sullivan, a personal finance consultant with the nonprofit credit counseling organization, Take Charge America, points out, having one income stream might simplify finances, but it can complicate your relationship. "Many times this leads to power issues and the non-working spouse feels devalued. Even when only one person works, both must have an equal say in financial matters and each one must have a role," Sullivan says. The easiest part is staying on the same page. This has allowed my wife and I to function as a team working towards a common goal – the short term perhaps being a vacation, and the long term being retirement. The hardest part is, well, pretty much anything else! Each partner, no matter their income level, can contribute. Farnoosh Tarabi, author of "When She Makes More: 10 Rules for Breadwinning Women," offers this suggestion: "If there's a huge income disparity, the one with the bigger paycheck might want to take on the biggest expenses. But the person who makes less needs to feel his or her financial contributions are important, too. Perhaps that person making less can put 20 percent of their income toward family vacations or retirement. When the family has something fun to enjoy, they can look back and say, dad or mom paid for that, and it can be perceived a huge contribution to the family." Set up an emergency fund and take challenges on as a couple. If you really want to test your marriage, see how it survives an unexpected financial emergency. Whether it's sickness, job loss, or a broken furnace, taking a hit to your income or savings and/or accumulating debt as a result can lead to lots of fighting and blaming if you've never planned for it. Set money aside in an emergency fund so you can combat any inevitable unplanned expenses that might arise. I can attest to the power of an emergency fund first-hand. Early on in my professional career, there were lots of slugging bricks year by year, including a handful of setbacks, and one unexpected layoff. Thankfully, my wife and I had been pooling an emergency fund for over two years by then. Of course the next few months of job searching were still stressful, but the emergency cushion saved us from selling the car and taking out a high-interest loan. Even if you start out with a few dollars per paycheck, keep growing it until the account can cover 3-6 months of living expenses. Consider bigger emergencies that can cause financial distress as well, says Pam Friedman, a certified financial planner, and author of "I Now Pronounce You Financially Fit: How to Protect Your Money in Marriage and Divorce." As she explains, "auto accidents, job loss, house fire or flooding or the possibility that a spouse become disabled, or dies — most of these risks can be covered by insurance to protect your lifestyle and assets." Did you know that about one in five Americans who are in a relationship admit they have spent $500 or more without their partner's knowledge? Sneaking around and engaging in secret spending isn't all that different from talking to an old flame on Facebook. Financial cheating is really just another form of dishonesty. Communicate clearly and consistently to prevent problems. Open communication and looking over financial statements together keeps you and your spouse accountable, and in the loop regarding what's coming in and what's going out (see more in the next chapter). Everyone has a different idea about how they want to spend their money and what their short- and long-term financial goals are, says Thomas Walsh, certified financial planner and portfolio manager with Palisades Hudson Financial Group's Atlanta office. This can lead to bickering ("You spent how much at the mall? "), or resentment ("I'm the only one around here who makes sacrifices!"). Build a 3-pot account system. Consider having "yours, mine, and ours" accounts, says financial expert Jean Chatzky. "It's a 3-pot system: I have a personal account. He has a personal account. We have a joint account, used for household expenses and purchases we decide to make together. I like it because I feel like you should be able to buy things – whether they're cups of coffee or pairs of shoes – without asking each other for permission," she says. 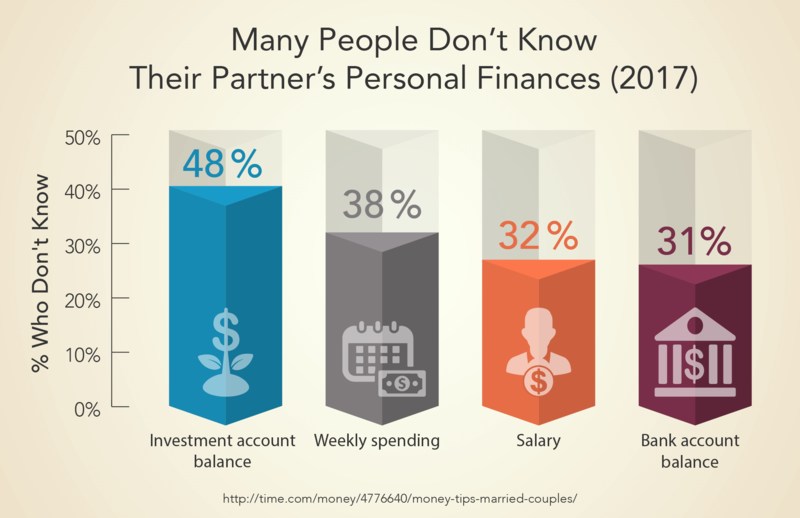 If you're experiencing any of the above financial face-offs, you're like most couples. But being able to recognize these partnership pitfalls and nip them in the bud will help protect your relationship bottom line. Take it from happily married couples who've been at it for decades: Working through money issues together, whether it's the day-to-day budget or big picture goals, will strengthen your marriage. As revealed in the Fidelity 2015 Couples Retirement Study, when seasoned couples were asked for their best piece of advice for newlyweds about handling their finances, the top suggestion was to save as early as possible for retirement (57%), and the second was to make all financial decisions together (41%). Sharing is caring. While the majority of couples (72%) think that they're on the same money page with their spouse, one survey by Fidelity found that they may not be as in sync as they thought. In fact, 43% of people couldn't correctly say how much money their spouse earns, and of those, 10% were off by $25,000 or more. Not knowing such basic facts could mean that there is a dollar disconnect in your financial partnership. Printing out a physical pay stub, doing taxes together, and sharing banking account statements can ensure that your finances are an open book. Joint accounts? Probably. Joint review? Definitely. Speaking of sharing, if you've been married for some time now, you're most likely already sharing your bank accounts — you've combined them and your money, like you two, are coexisting. Many couples and experts feel that's the right thing to do as it correlates with "communication," "openness" and "trust" — all those marriage buzzwords everyone's always talking about. "I think it's important to have both names on every account," affirms Keith Klein, a certified financial planner and owner of Turning Pointe Wealth Management in Phoenix. "It eliminates some trust issues." More practically speaking, many believe joint accounts help prevent money secrets between spouses, clearing open a wide, scrupulous path for couples to communicate their financial goals. You're both aware of who's spending and saving (or not saving) what, and all your financial cards are on the table (or on your smartphone when you check your account summaries). On that note, going all in on joint accounts also means helping manage them together. Be sure to sync everything with a easy-to-use app like Mint, which will enable you to track — and then collaborate — on your financial comings and goings, most specifically where your money will let you go as a married couple. Work together to determine how much can and should be spent on groceries, dining, home improvement, vacations, etc. Yet another perks of marriage: tackling your money issues as a team! "Budgets are a great way to solidify money agreement," says Mackey McNeill, CPA/PFS and member of the American Institute of CPAs Consumer Financial Education Advocates. Trying to wing it will just lead to miscommunications, misunderstandings, and money mismanagement. Whether you use a spreadsheet or an app, it's best to sit together to go over monthly income and expenses on a regular basis, and be sure to discuss any necessary adjustments accordingly. Have money dates. In TD Bank's Love & Money Study, 42% of respondents who talk about money with their spouse at least once per week described their relationship as "extremely happy," compared with 27 percent of those who talk about money less than once per month. Pairing finances with a fun activity can make it less boring. That could mean enjoying a decadent dessert together while you talk things through, for instance. During these talks, set some ground rules based on what is working and what isn't. "Done right, these meetings are short and sweet, and keep issues current," says McNeill. Control the purse strings together. Deciding who actually balances the checkbook, pays bills, and keeps watch on investments might be different for every couple, but you want to be sure that no one is made to feel that they're doing all the work. Choose a "family CFO". Just like companies have a Chief Financial Officer (CFO), a family needs one too, says Kevin Brauer, CFO of Affinity Federal Credit Union. "This person should be comfortable in dealing with topics around money and be able to commit the time to handle financial planning, budgeting, bills, and much more," he says. Divide and conquer. Consider dividing the financial work based on each person's strengths, suggests Walsh. "If one partner is great at tracking and organizing things, let them be in charge of paying the bills. Perhaps the other partner can handle investments or running errands to the bank. If you are filing a joint tax return, be sure someone takes responsibility for organizing all of the documents, and providing them to the tax preparer on time," he says. Set ground rules. Your list of money rules should always be a work in progress, so there's nothing wrong with amending them as dynamics change. The key is to set some guidelines that you can both live with. These could be anything from agreeing to discuss purchases over a certain amount, for instance, or choosing not to lend money to anyone without partner approval. Personally, my wife and I have a rule that we can't sign up for any new credit cards on our own. The biggest rule you need to remember is that there is no right way or wrong way to manage finances together. As long as you and your spouse are regularly communicating (and negotiating) with one another, you can find solutions that fit your marriage. There are probably a million reasons for wanting to avoid divorce, but here's another one: It will cost you both, big time. Research from Ohio State University estimates that divorced people experience a 77% reduction in wealth, even a decade after the divorce is final. Those who stay married, however, enjoy a 93% growth in wealth over this same period of time. Besides losing out on all of the financial perks that you had when married, there are a host of other cash-related complications that result when you break financial and marital ties with a former spouse. "Divorce requires some legal and financial education to understand what is joint and separate property under your state laws, so that you leave the marriage able to transition to single life successfully without worrying that your and your children have enough to move forward," says Friedman. Deciding what belongs to whom. How assets and outstanding debt are divided should you ever divorce may depend on the state in which you live, especially if no legal prenuptial agreement is made in advance. 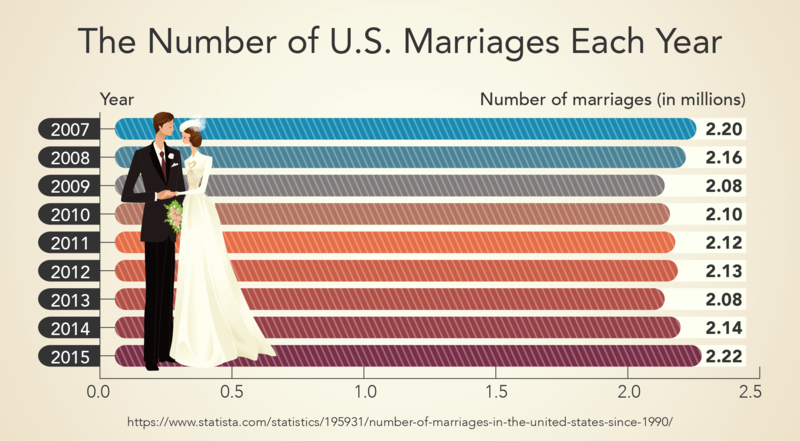 If you live in one of the nine community property states (Arizona, California, Idaho, Louisiana, Nevada, New Mexico, Texas, Washington and Wisconsin; plus Alaska, where it's optional), everything attained during the marriage will be divided 50/50, regardless of whose name various accounts are under. In other states, there will be a lot more fighting about who keeps and owes what. Debt ties bind even after divorce. "Debt, just like any other possession, has to be divvied up and redistributed during divorce. Unfortunately, this can make an already difficult process even more stressful," writes Leslie Tayne, attorney and author of "Life & Debt." If an ex-spouse neglects to pay post-divorce on an account in which he or she is an authorized user, for instance, there isn't much recourse you will have. The card issuer wants to get paid, and it's the primary card owner who is legally on the hook for the debt, no matter what the divorce decree says. If divorce is the unfortunate outcome of your marriage, it's in everyone's best interest to try to settle debts prior to the proceedings, if possible. Better still, try to live as close to a debt-free lifestyle as possible and keep personal debt separate while you're married. Getting divorced often depletes the couple's savings to pay attorney fees and other related costs, and it may force at least one spouse to give up assets; for example, the couple might have to sell the home that can no longer be afforded on a single income. Of course, for some couples, divorce may be the best option, regardless of the financial impact it may have. But if money issues also happen to be the underlying reason for considering a split, seeking help and guidance on how to become better money managers is worth a try. Whether it's creating a budget, figuring out savings goals, or managing a financial crisis, couples shouldn't hesitate to get some advice from an objective outsider. Not only will it help your bottom line as a couple, but it could also ultimately save your relationship. Working with a financial advisor means that neither spouse is on the hook for a poor decisions, and emotions or biases (which could come from well-meaning family members, for instance) won't prevent you from getting solid advice. In addition, working with a financial pro can help you figure out how to weigh your immediate concerns (budgeting, paying off debt) with your long-term goals (retirement, college savings for children). Having a game plan in your 20s and 30s could potentially help you in your 50s and 60s, and well beyond. A tax professional (or tax software). "Make sure you're getting all the tax credits you're entitled to as a couple," explains Livingston. "And as you near retirement age, look into your options for collecting Social Security to get the most out of your combined benefits." Family taxes are a headache without professional help. Trust me. When your income, assets, and expenses are combined with another person's, tax returns get more and more complicated – especially if you also add children, a business, or investments into the mix. A professional can help you decide if you should file taxes separate, or as a married couple. Depending on your income and tax bracket, doing one over the other can save you money. Wealth management/financial planner. "Marriage can be beneficial for couples to improve their tax, estate planning and retirement opportunities. If these topics sound complicated, it's because they are, and the reason there is an entire industry based upon providing individuals comprehensive financial advice," says Walsh. "Even couples well-versed in managing their finances would greatly benefit from a relationship with a comprehensive financial planner." A third party can be objective, and won't have any unresolved feelings about the money argument you had last year. Sitting with someone who can take the emotion out of financial matters will help you make more informed decisions together. Couples counseling. 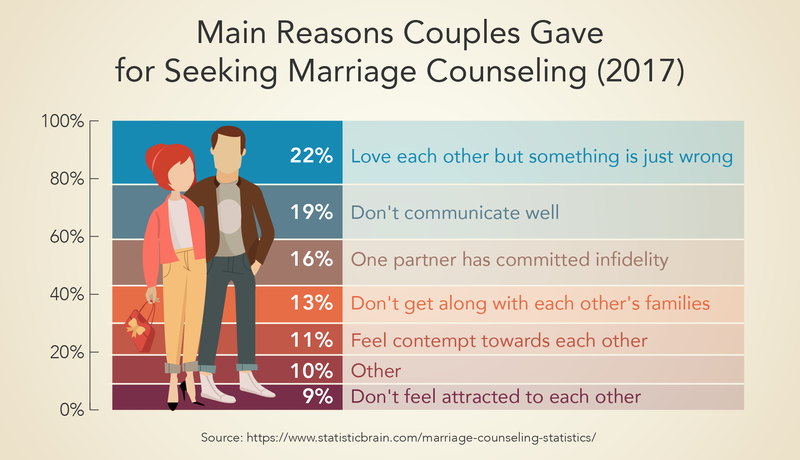 If money mismanagement is a symptom of larger marital problems such as a lack of trust or communication issues, than treating the root of your problems by seeking the advice of a marriage counselor is likely to be more effective. If you can (hopefully) work out those issues, than you can start implementing systems to help alleviate your money spats. Having a neutral party to listen and give you tools to work through your underlying issues will help you improve communication. Another key to managing your finances after marriage is finding DIY resources to help you on a daily basis. Mint.com. A popular choice for those who are having trouble sticking to a budget. You'll get a snapshot (in real time) of all of your personal finances including bank accounts, credit cards, and investments. Having your financials at your fingertips will help keep you both on the same page. Account alerts. Set up notifications on bank and credit accounts to stay on the same page. This can help avoid a joint checking account being overdrawn because one of you forgot to tell the other they paid a bill. No more ‘you forgot to tell me that you took out $100, and I bounced a check' tiffs. Dave Ramsay'sEveryDollar app. Access your budget on the go. Along the lines of Mint, you'll know to reign in your spending when funds are low — so maybe you'll know to pass on that pricey lunch invitation. Couple Moneywebsite andpodcast. If you want some real-life strategies from couples and money experts on how to save more, conquer debt, build wealth together, and stop fighting about money, you'll get all that and more. Hearing from other couples can make you realize that you're not alone in your struggles. Just as you'd call a plumber to deal with a leaky faucet or see a doctor when you're not feeling well, consulting with a financial professional or using tech tools can help you and your spouse work through both big financial decisions and minor money confusions. Especially if you're fighting over money, bringing in a third party for a different perspective can work wonders for both your marriage and your bottom line. I know that my wife and I will have our battles ahead. She wouldn't be as amazing if we didn't. But I also know that because we took the time to listen to how each of us thinks about money and know what the other wants to do with the money we're saving, we have an understanding and respect between us that allows us to tackle all the relatively "easy" management details. By finding common ground with your spouse – even if he or she has a different money mindset — you can maximize the financial perks of marriage to build wealth and security together. More importantly, you can power up your finances together and avoid relationship-draining arguments and bitterness. Now that you're ready to give your marriage a money makeover, be sure to share the strategies and resources presented in this guide with your spouse. Have a glass of wine, like we do! That way, you can more effectively manage your finances together moving forward — and grow rich in love. Are you in a relationship and thinking about next steps? Or do you want to know more about how to better manage your money as a couple? Take a quick minute to look over these great articles about managing money as a couple. What money management tips have helped save your relationship AND you money? What did you find the hardest to convince yourself or your partner to do when it came to managing finances? We'd love to know. Please tell us in the comment section below.